Identification: The body and cerata of this species are translucent white with opaque white and olive flecks. The finger-shaped, dorso-lateral cerata are arranged in 6-10 transverse rows and, in adult animals, can be unusually elongate. The digestive gland ranges from olive green to brown to black and is visible through the cerata. In Hawaiian specimens, the cerata have two subapical white bands rather than one. The rhinophores are smooth and there is dark pigment on the head in front of them. Distribution: Oahu: Tenellia perca is native to the Caribbean from Florida to Brazil but is now also found in California, New Zealand, Ghana, West Africa and the Mediterranean. 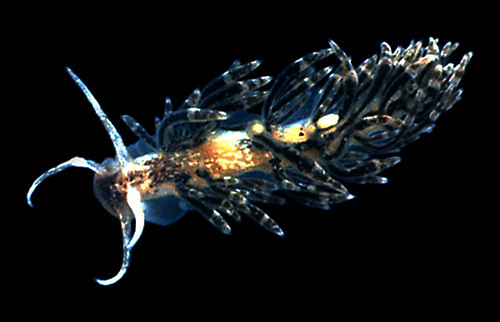 Taxonomic notes: It was first recorded in Hawaii from Kaneohe Bay, Oahu by Terry Gosliner in Oct. 1972 and is listed in Gosliner, 1980 and Kay, 1979 as Cuthona perca.